The Conference of the Southeast Asian Ministers of Education Council (SEAMEO Council), the policy-making body of the Organization, is convened by the Secretariat some time in January through March each year. It may meet in an Extraordinary Session. It is attended by Ministers of Education of Member Countries, representatives of Associate Members, Centre and Network Directors and Coordinators, SEAMEO Secretariat officers, and observers from donor governments, foundations, international organizations and agencies. 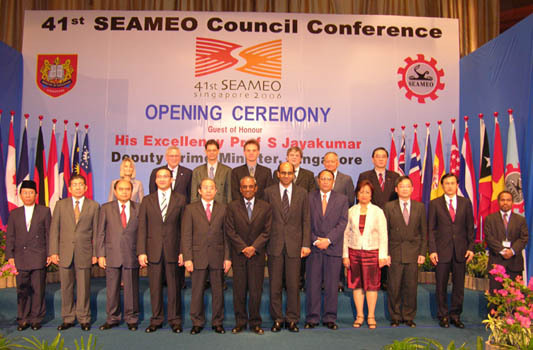 The 41st SEAMEO Council Conference was held 22-24 March 2006 in Singapore. Indonesia will host the 42nd SEAMEO Council Conference in early 2007. The SEAMEO Education Ministers and officials, representatives of Associate Member Countries and partners during the opening of the 41st SEAMEO Council Conference on 22 March 2006 in Singapore.